I created this card with a bundle from the new catalog coming out in June. To make this card I used the Eastern Beauty stamp set, Eastern Medallions Thinlits Dies, new in colors cardstock and ink pads. This set comes with Designer Series Paper (DSP), but I decided to create my own DSP. Card measurements: 4 1/4" x 5 1/2 " with matching envelope. Cut berry burst cardstock 8 1/2" x 5 1/2", score @ 4 1/4"
Use Eastern Medallions Thinlits and die cut 2 7/8" x 2 7/8" design on berry blast cardstock. 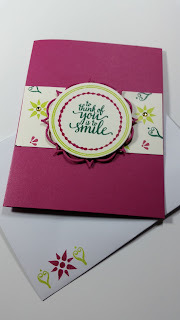 Use Layering Circle Framelit and die cut 2 3/8" circle on very vanilla cardstock. Stamp very vanilla cardstock 4 1/4" x 5 1/2" with different eastern beauty stamps to create custom designer series paper (use several stamps). Stamp very vanilla circle with sentiment and design from Eastern Beauty Stamp set. Decorate envelope with coordinating stamps. Score card base using bone folder. Attach custom designer series paper to card base with snail adhesive. Attach very vanilla circle to medallion shape with dimensionals. Attach the completed embellishment to card base with up to 3 dimensionals. To give the card that extra pop use gold metallic enamel shapes. Woohoo the project is complete! available to purchase starting May 2. Join my mailing list for a free catalog! Purchase $50 or more and receive a *free set of blank note cards with envelopes*. The "Many Manly Occasions" kit came with all the supplies to make 8 cards and matching envelopes. One of the great perks of being a Paper Pumpkin subscriber is the ability to use your left supplies and stamp set on other projects. Since I've been a subscriber making alternative projects with leftover supplies and the stamp set is one of my greatest joys. Whenever I receive my kit in the mail I always plan a project to create outside the box. 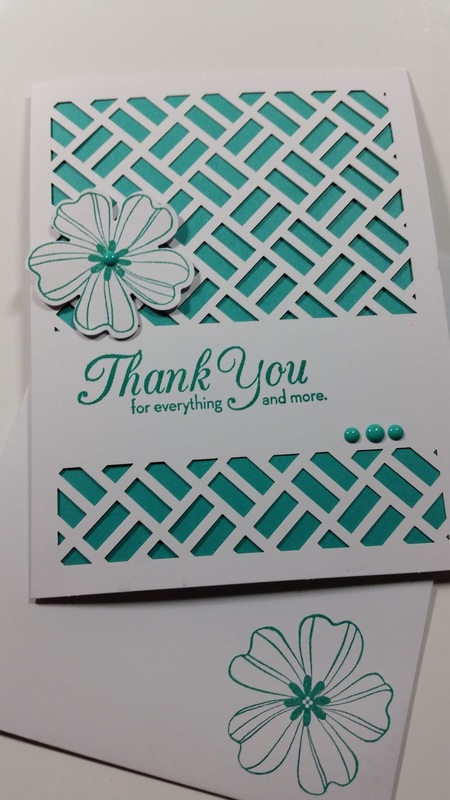 I used the supplies from this kit and made this great "Thank you card". With a few other great supplies from Stampin Up I created this card. Laser cut whisper white card base and envelope. Stamp card base with sentiment from One Big Meaning stamp set. Stamp flower image from Flower Shop stamp set on whisper white cardstock. Cut Bermuda bay cardstock 4 1/8" x 5 5/16" for inside of card base cover. Punch flower image from whisper white card stock using the Pansy Punch. Attach Bermuda bay cardstock to inside cover of card base using min glue dots. Attach punched flower embellishment to card with dimensionals. 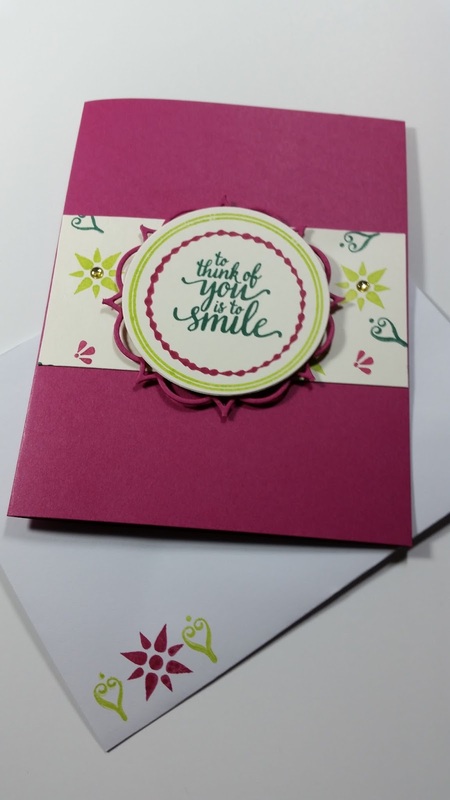 Add enamel shapes to card base and flower center for the extra pop. To makes this super cute card and other alternatives from your Paper Pumpkin kit join my team. If you join by May 10th your name will be enter into a drawing for a free kit. Free Paper Pumpkin Kit !!! How would you like to receive two all-inclusive kits for the price of one? your name will be entered into a drawing for a free kit. and exciting happy mail. Get this complete kit for just $19.95 (shipping included). to go for a fun project. Your kit will include stamps, ink spot, pre-cut materials, embellishments, and instructions. You will also receive a FREE STAMP BLOCK with your first kit. A monthly subscription is $ 19.95 (shipping included) and you can cancel anytime. Just think you if you're the lucky Winner you will be getting two kits for the price of one. You will receive your first kit in May and then your other kit when you choose. A Crafting Party in a Box!!! Still not sure if this is something you would like, then check out my video. "Unboxing April 2017 "A Sara Thing" kit. This card was created with materials from the April 2017 kit. Don't miss out, Subscribe by May 10th! 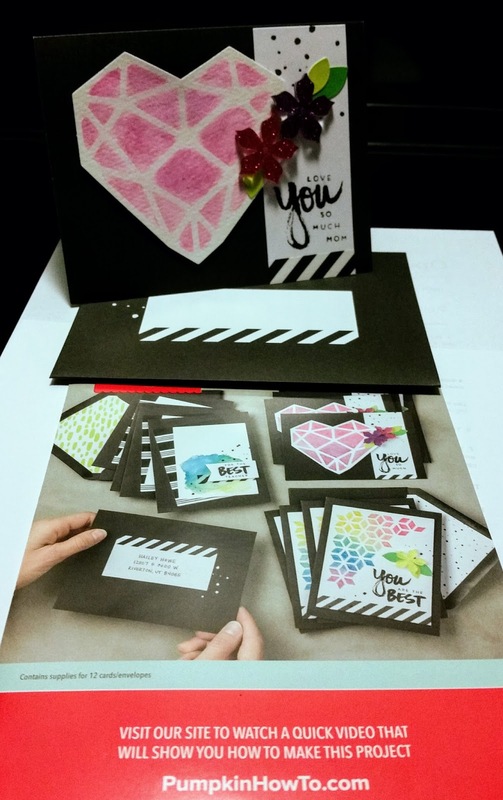 Join the Fun: Become a Stampin Up Demonstrator! Are you a hobby stamper or paper crafter who would love to get your crafting supplies at a discount! Perhaps you interested in earning extra income doing something amazingly fun! 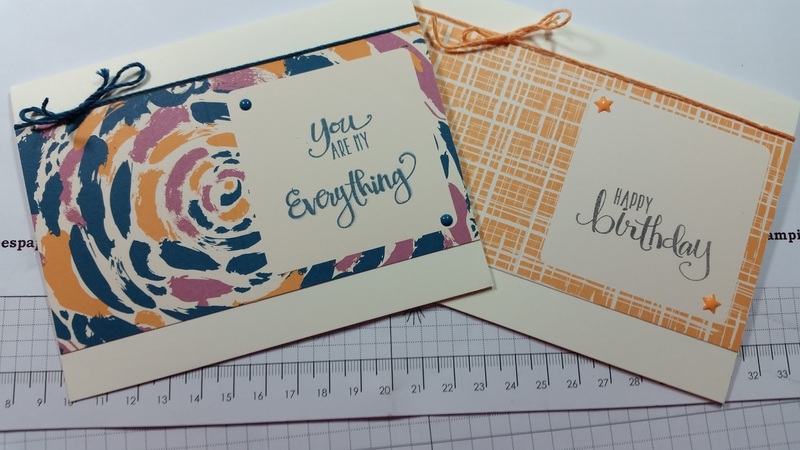 Maybe you are ready to explore a whole new level of stamping with a really fun group of fellow stampers? Then consider joining Renee's Paper Stampers - join the fun! Not ready to sign up yet, please keep reading! I would love to have you join Stampin Up and become a member of Renee's Paper Stampers! When you purchase the Stampin' Up! Starter Kit and become part of my Paper Stampers as a Stampin' Up! demonstrator, you are in for hours of endless crafting fun! You are welcome to run your business your way and I'll be with you every step of the way! As a member of Renee's Paper Stampers we will share swaps, challenges, tutorials and our love of stamping. Take your passion for paper crafting and SAVINGS to the next level by joining Stampin Up! · You start your own business for only $99! The starter kit actually allows you to purchase $125 worth of stamping supplies. You will also save an extra 10% on starter kit (free shipping). · The flexibility of setting your own hours and working from home; it provides part-time to full-time income and you're your own boss. · Get 20% discount on all your future orders. · You can earn free stamp sets, free stamping supplies, earn extra cash, and incentive trips. 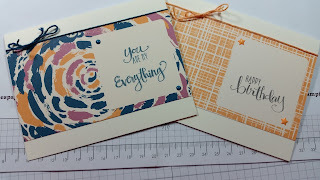 · You get access to Stampin' Success & Stampin" Connection...exclusive resources available to Stampin' Up demonstrators. · Your first two months of your online demonstrator business website is free (your online store)! · On your first order of $150 0r more and placed with 45 days of signing up your discount is 30% off! An enthusiastic and creative coach. I will give you as much (or as little!) support as you need or want without being a nuisance. I'm always available be phone or email. I will also work very hard to answer all of your stamping and business questions! You will receive my weekly newsletter "Paper Gems", with all the latest information, tips and promotions being offered from Stampin Up! Give this business a try. Become a member of the Stampin' Up family and enjoy endless hours of crafting fun! The Seasonal Bells stamp set and punch offers endless creative possibilities. During the Christmas holidays I used this bundle to make several cards. I wanted to see how I could use this same bundle to create a Wedding card. Cut whisper white cardstock 8 1/2" x 11 score@ 4 1/4"
Punch out two hearts from the glitter paper using the Cookie Cutter Punch. Punch out a bow from glitter paper using the Holly Berry Punch. Stamp whisper white stitched square shaped with sentiment from Seasonal bells stamp set. Stamp sweet sugarplum cardstock with two different bell images. Use fast fuse to attach stitched square to designer series paper, then attach both pieces to card base. Use dimensionals to attach punched bells to card as extra embellishment. To add extra bling to card use dimensionals and glue dots to attach glitter paper bow and hearts. The "Bunny Buddies" kit came with all the supplies to create 12 cute canvas treat bags, 3" x 3" cards with envelopes. I made one of the projects from the kit and as you can see it's adorable. 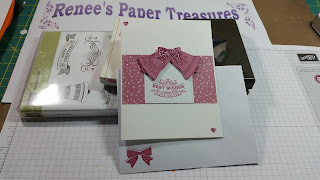 In this kit I took two of the 3 x 3 greeting cards and repurpose them into super cute alternatives. Cut very vanilla cardstock 8 1/2" x 11", score @ 5 1/2"
Cut 3" x 3 card down 5 1/2"
Stamp very vanilla cardstock with sentiment from Everything stamp set (Paper Pumpkin). Use dapper denim and basic gray ink pad. Use fast fuse to attach 3 x 5 1/2" to card base. Tie twine around card and make a bow. Add enamel shapes to give the card that extra bling.